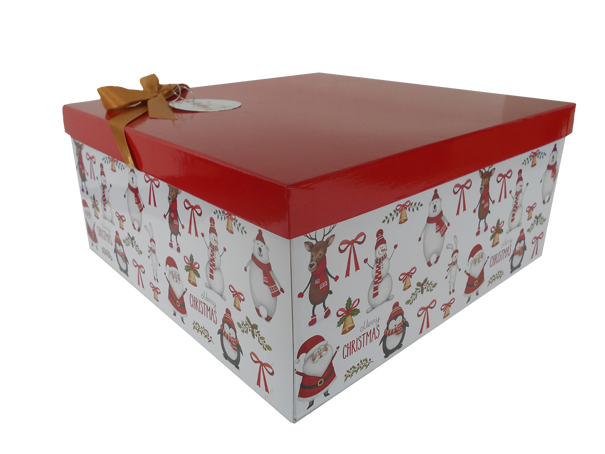 Gift box with lid, bow and co-ordinating gift tag. Each box is packed flat and includes easy to follow assembly instructions. This design has a blue and silver Christmas design box, matching lid, blue bow and matching gift tag. Assembled measurements are 103mm wide x 103mm deep x 98mm high. I purchased 12 of these boxes again this year as I was so pleased with them last Christmas. I'm a little disappointed as there isn't as much choice in designs this years and I'm sure this years boxes are a little smaller. But that aside I'm very happy with the quality of the boxes and they're certainly cheaper that buying gift bags from the shops.